Dual Language Learning: What does it take? Current neurological research shows that young children learning two languages develop an increased cognitive and problem-solving capacity that extends into ALL areas of learning. ALL children benefit intellectually, for their lifetime, by learning two languages in early childhood!! We believe that certain systemic changes in our society can be brought about right at the grass-roots level of early childhood education. We are looking to the future community that our children will live in, and we know that important demographics are changing. Even today, individuals who can read and speak Spanish have a professional advantage. Our program incorporates both Spanish and English language acquisition goals right from the start. 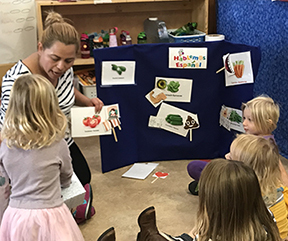 Through our unique Garden and Spanish Specialist programs we are able to include Spanish language in all the classrooms. We use a STEM Curriculum that engages the students in both English and Spanish. All of our kids are listening, learning and speaking in both Spanish and English. If you are a parent and wondering why this is significant for your young child, you can be assured that he or she will be navigating a future culture where the Latino aspects of all U.S. communities are and will be expanding dramatically. Demographic trends show that by 2050, Anglos will be a 47% minority in the US population. Becoming bilingual is the first step to being at ease and mastering cultural competency. This is also crucial for Latino children because they often lose their own native language as they enter the mainstream of community life and public school. A significant recent research study, “Para Nosotros Ninos” (4.5MB pdf file) has shown that retaining the native language is important for the future success of Latino children and the health of the community in general.